This paper provides guidance for selecting and purchasing a virtual workspace solution to enable your totally mobile workforce. 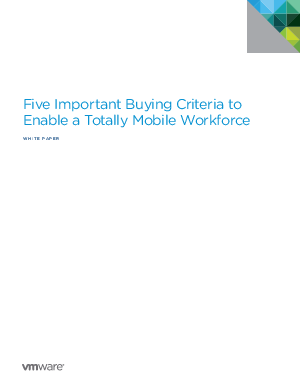 Five buying decision considerations that directly impact the success of your mobile workspace strategy are discussed in detail. Recommendations for the most critical specifications are given to help you in defining an effective virtual workspace strategy for your environment. The intended audience for this paper is enterprises seeking to empower a completely mobile workforce while enabling IT administrators to manage and secure their rapidly changing networks. IT decision-makers and line of- business leaders alike will find the insights presented helpful for executing a mobile conversion strategy.